University of Chicago Press, 9780226142692, 592pp. One of the most important figures of the American civil rights movement, Bayard Rustin taught Martin Luther King Jr. the methods of Gandhi, spearheaded the 1963 March on Washington, and helped bring the struggle of African Americans to the forefront of a nation's consciousness. But despite his incontrovertibly integral role in the movement, the openly gay Rustin is not the household name that many of his activist contemporaries are. In exploring history's Lost Prophet, acclaimed historian John D'Emilio explains why Rustin's influence was minimized by his peers and why his brilliant strategies were not followed, or were followed by those he never meant to help. John D'Emilio is professor of history and of gender and women's studies at the University of Illinois at Chicago. Policy director of the National Gay and Lesbian Task Force, he is coauthor of Intimate Matters: A History of Sexuality in America, published by the University of Chicago Press, and author of The World Turned: Essays on Gay History, Politics, and Culture. "Lost Prophet is one of the saddest stories you will ever read. Rustin was a charismatic leader, a lifelong pacifist, an imprisoned conscientious objector during World War II, and a leading American teacher of Gandhian nonviolence . . . But Rustin was also gay, decades before the Supreme Court legitimated private sexual activity, and that cost him the backing of some radicals, black as well as white, for whom he had been an eloquent and courageous leader for nearly 40 years. . . . D'Emilio succeeds in detailing a highly useful life and--a prime task of biography--in redeeming a nearly forgotten figure and assigning him a proper role in an era that becomes more beclouded and mythologized with every passing year." "A sympathetic, probing biography that brings homosexuality to the fore as a factor in the black activist's seminal but largely forgotten role in the civil rights movement. An eye-opening look at the personal ordeal underlying a revolutionary quest." 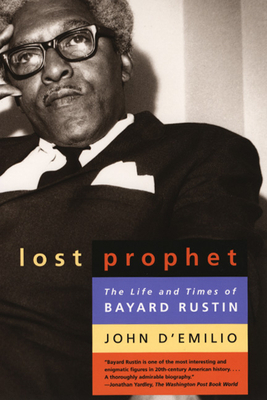 "Drawing on interviews with Rustin's colleagues, friends, and lovers, D'Emilio explores all facets of the activist's life, from his Quaker upbringing and early imprisonment for draft dodging to his close but tenuous relationship with Martin Luther King Jr."
"Bayard Rustin became famous for working behind the scenes. The tactics of public protest that became familiar in the 1960s marches on Washington, Freedom Rides, sit-ins, passive resistance, civil disobedience were pioneered and refined by Rustin two decades earlier. Indeed, through his decisive influence on Martin Luther King Jr., Rustin created the model for the social movements of post-World War II America--civil rights, antiwar, gay liberation, feminist." "A lively, detailed, immensely readable account of this key figure of the 20th century, including information about his sexual life and relationships." "D'Emilio's work contributes greatly to the literature of Bayard Rustin and the civil rights movement. . . . Thanks to D'Emilio, not only have we found a 'lost prophet,' but we have a much better understanding of why he was lost in the first place." "D'Emilio's biography is an important book about an important man, well researched, with particularly perceptive insights into gay culture in America as well as providing a solid account of the history of the peace movement and the civil rights struggle."